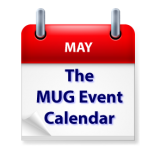 Bryan Chaffin of The Mac Observer is the notable featured speaker on this week’s MUG Event Calendar, with an appearance at a California group. A detailed examination of DaVincie Resolve is on tap at a California creative pro group, privacy will be discussed at a Virginia group, and accessibility is on the agenda at a Florida group. Los Angeles Creative Pro Users Group – DaVinci Resolve 15. Paul Saccone and Mary Plummer will tell and show all, including Fusion and Fairlight. Plus a VERY special presentation from Director/DP Lukas Colombo and Director/Producer Jacob Mann who will talk about their use of Blackmagic Design’s newest line of Broadcast solutions and how they were used in their latest live production for Cirque Du Soleil’s Mystere! Washington Apple PI – The End of Privacy?